Check Out BJ's Restaurant & Brewhouse in Pensacola, FL, for Amazing Beer, Food, and More! When you need a place to go in Pensacola, look no further than BJ's Restaurant & Brewhouse! For nearly forty years we've been creating exceptional drinking and dining experiences, and we're glad to be part of the Pensacola scene! You can see some of what we have to offer on our website, but the best way to find something you love is to head to BJ's! Here at BJ's Restaurant & Brewhouse in Pensacola, we don't settle for the ordinary when it comes to beer: our eleven handcrafted beers have won over 160 awards over the years, and they're sure to please! Hopheads will love our intensely hoppy Piranha® Pale Ale and our Hopstorm® IPA, while those who prefer a smoother, more balanced session beer will enjoy our Brewhouse Blonde®, Oasis® Amber, or Nutty Brewnette® American Brown Ale. We have guest taps and seasonal offerings, and we even offer our unique LightSwitch® Lager, a fresh and flavorful alternative to standard mass-produced light beer. 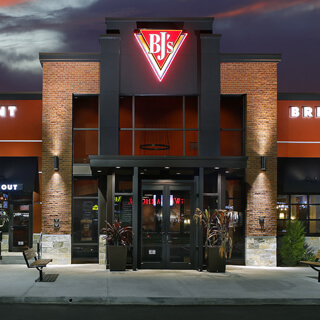 BJ's Restaurant & Brewhouse started out as a pizza place, and we continue to honor that heritage to this day. Our Signature Deep Dish Pizza combines the best of Chicago-style deep dish with California-style pizza toppings; you can order something like our BJ's Favorite pizza, California Supreme pizza, Gourmet Five Meat pizza, or Vegetarian pizza, or build your own pizza--and don't forget to check out our Tavern-Cut Pizzas! Our menu contains so much more than just pizza: from Handcrafted Burgers to pork and ribs, from tacos to Enlightened Entrees® to our kids' menu, BJ's Restaurant & Brewhouse has something for everyone! Our Hickory Brisket and Bacon Burger is a local favorite here in Pensacola--you should give it a try! Just be sure not to get too full for dessert, or you'll miss out on our world-famous Pizookie®; it comes in a number of varieties, from the more classic like the Chocolate Chunk Pizookie® to the more innovative, like the local favorite Monkey Bread Pizookie®! BJ's Restaurant & Brewhouse in Pensacola, Florida is a favorite spot that's perfect for all kinds of uses. Throwing a party for a special event? BJ's is a great place! Going on a date, having dinner with the family, or just looking for a place to grab a beer and watch the game? We're great for that, too! We look forward to showing an amazing dining experience.